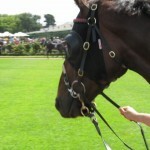 I’m paying more attention to the bridle now that I’m keeping track of Kineton nosebands and Norton bits. So I spent most of the day trying to get a decent photograph of a bit lifter and you’d have to say that I failed miserably. 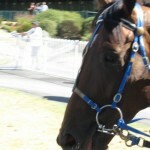 Bit lifters seem to be mainly used on horses that get their tongue over the bit. They are simply a Y-shaped leather strap that attaches to the headpiece or brow band and runs down the horse’s face to the bit rings. They are probably a fairly benign piece of gear, although they may force the horse to lower its head a bit. I’ll keep trying to get a decent photo. 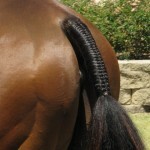 The only other attention grabber was the fine braided tail on Meadows Mollie who ran seventh at 50/1. Whilst I admire the artistry my general view is that strappers should pay more attention to the other end and make sure the horse has its head in order. Four bets for two losers, Eternal Sunshine and Godliness, and two even money winners, Giresun and That’s Not It. Didn’t go backwards, didn’t go forwards. Just marking time. A beautiful bride. But whoever gets married on a Saturday? I had a busy day with the camera today. I’m trying to put together a decent library of bad behaviour on Youtube and today there seemed to be kickers galore- horses kicking out in their stall – everywhere. I settled on Winged Charm who must have let fly with twenty or so kicks before I finally decided to try and record it. The usual deal is that as soon as you start recording the horse decides that it doesn’t feel like being in a movie and gives up. And so it proved. But I managed a small grab of restless behaviour and two minor taps. When Winged Charm appeared in the yard for the last race she was all sweetness and light and totally relaxed and ran an excellent race for fourth. Other kickers racing today included Canonized, Rabbuka (in resistance to being saddled), Oamaru Rose, Zedi Power and Our Serena. Canonized ran second, Oamaru Rose was fourth, Rabbuka eleventh of twelve, Zedi Power tenth of eleven, and Our Serena sixth of twelve. In the book kicking has a behavioural handicap of 26%, and this statistic has barely changed in recent times. In other words, kicking horses can be expected to win 26% less often than expected by chance. That is a serious disadvantage and is why I never back kickers. I’m also trying to get together a decent photographic record of different bit types. I managed a shot of a Norton bit on By The Way, but as my school report used to say, I could do better. The Norton is quite a serious bit used on pullers and I’ll try to do it more justice in the future. There was also an interesting bandage on the pastern of Chartreux and Star of Jeune sported the rarely seen martingale – a single strap diving down between the front legs that is meant to stop the horse throwing its head up. 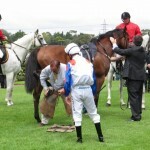 And the farrier inspected a loose off hind plate on Warringal Warrior but left it at the trainer’s request as the horse was a bit edgy in the mounting yard. The plate was lost in the running! Dennis the farrier later told me that you can sometimes see a flying plate on the race replay. I had a good lookout for a flying sliver of silver but couldn’t spot it. And punting was busy with four bets, for two placed horses, Deductible and Ravenous Lass, and two hopeless losers, not worthy of a mention. But the worst of it was my best bet of the day, Platamone Castle. I went to line up for my bet with two minutes to go and there suddenly seemed to be people everywhere. This was a rent-a-crowd. Where did they all come from? There were seven tote operators and a queue of four hopefuls at each of them. With one minute to go I jumped queues, which is always a no-no. I was still third in line when they jumped. Twenty punters let out an audible cry of anguish. Mine was the loudest. 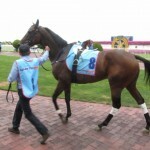 Platamone Castle got third at $2.80. When I finally left the track I was still spitting chips. 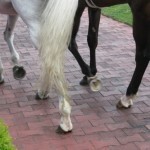 I’m trying to train my eye to look at the horse’s feet – but am finding it very difficult. The main problem is that it doesn’t leave much time to look at everything else, which is probably more important anyway. I’ve become very interested in bar plates since a recent talk with Dennis Kennedy, the MRC farrier. It’s generally recorded in the race book gear information when a horse has bar plates for the first time, but in subsequent runs it doesn’t crack a mention. I’ll probably have to start another list, like I’m doing for the Kineton nose band. 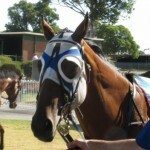 Dance Man had the bar plates on today and finished tenth of thirteen in race six. The impressive bandages bedecking Below below the hocks were the only other gear of note. The horse finished ninth of nine. I backed Eleve in the second and the apprentice jockey J Duffy went for a run that wasn’t there and copped an eight week suspension. The horse should have won by a street. And I had another loser in the last with Token Of Honour, but my honour had been previously saved with the win of Wealthy Lad. The lad left the course happy, but not overly wealthy. It’s looking ominous. The forecast is for 40 degrees, my official meltdown point. And worse. The stewards have rescheduled the first race to start at 11.50 am with the last at 3.20 pm. 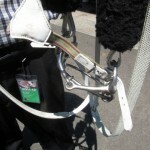 The chief steward Terry Bailey is quoted in the paper as saying that “it won’t be a pretty presentation of racing … as the horses will be brought into the mounting yard and the riders will immediately mount up, and once they arrive at the barrier stalls they will be placed in and dispatched as quickly as possible.” It throws me right out of whack. Whoever has their lunch at 10.30? Life wasn’t meant to be easy for horse watchers. And so it proves. Not pretty. The horses are held back in the birdcage until the last minute and then rushed up to the mounting yard where the jock hops on and straight out onto the track. I only have half a second to look at each horse and some I miss altogether. No time for photography. And I even missed a mares race altogether. 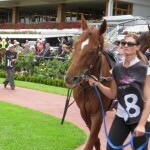 I was spitting chips as I was quite keen on Louisville Dancer after backing it last start at Sandown in a mid-weeker. But no see, no bet. It won in a breeze. In the end three bets for two placed horses, Kasane and Chasse, and a loser, Crafty Cruiser. Not too bad a start.